The Thomas Fire was directly responsible for destroying 1,063 structures as well as razing all vegetation over hundreds of thousands of acres of scrubland and mountainous terrain. While the Fire was largely contained by the time the area was hit with the first, measurable rainstorm on January 8, 2018, the destruction of all vegetation created unstable soil in the hillsides, allowing the heavy rains to develop into massive mudslides. Occurring mostly in the mountainous area of Montecito, massive waves of mud swept through violently destroying homes and lives. As of this article, over 100 homes had been destroyed with another 300 damaged, and the death toll from these mudslides had risen to 21 people with a number still missing. The mudslides injured dozens of others and resulted in over 160 hospitalizations, including a number of people who were critically injured. Workers continue to clean up and reopen the roadways and freeways blocked by the mudslides, including the busy 101 Freeway. On January 8 the first low pressure rain system swept over Santa Barbara and Ventura Counties dropping between 2 to 4 inches of rain over a two-day period. 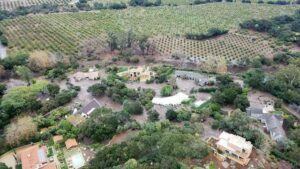 The first mudslides struck Montecito during the early morning of January 9. An intensely heavy but brief period of rain, is believed to be the trigger. Half an inch of rain fell in the Santa Ynez mountains during a five-minute period at 3:30 a.m., triggering mudflows that traveled at speeds of 20 m.p.h. slamming into the Montecito area below. With its arid climate and mountainous terrain, California is not a stranger to mudslides. However, this event was different. Most of the past mudslides took place after record or near record rain events, making Mother Nature the primary culprit. In Montecito, while the rains were heavy they were not record or even near record rain events. The primary cause was the unstable soil from the destruction of all vegetation by the Thomas Fire. The Thomas Fire was man-made, or it certainly seems. While Cal-Fire has not concluded its investigation, there is extremely powerful circumstantial evidence that So Cal Edison’s power lines sparked the Thomas Fire. 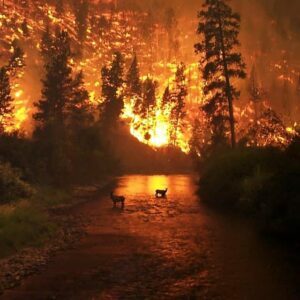 In California, 95% of all wildfires are caused by man; Mother Nature, in the form of lightning, is the cause of the other 5%. There were two ignition points for the Thomas Fire, both of which started less than 30 minutes apart. The first began at 6:26 p.m. just north of Santa Paula near Thomas Aquinas College in Ventura County. A second ignition point occurred a short time later about four miles away near Upper Ojai. Multiple eyewitness reports note that the cause of the fire at the second location was sparked by an exploding electrical transformer. And now there is evidence that a So Cal Edison crew working on a construction site at the location of the first ignition accidentally started that fire. SoCal Edison has publicly admitted it is under investigation for its role in the either causing or exacerbating the fire. Unfortunately, this would not be unusual as many of the largest and most destructive wildfires in California history were caused by utility companies negligently maintaining their power lines or other equipment. Perhaps this is the new normal. After a five-year drought, the 2016-17 rainy season was one of the wettest in history causing massive new vegetation growth. What followed was a 10-month period of drought killing all the new vegetation that had grown only 10 months before. By the time of the late-arriving Santa Ana winds, in December, Southern California was a tinderbox full of dead vegetation. More periods of extreme drought, heat and wind which can turn what would be a small, controllable wildfire into a raging, uncontrollable wildfire like the Thomas Fire, which at one point was classified as a “firestorm” responsible for creating its’ own weather, a rank few fires reach. Climate change may mean we see more extreme events like this in the future.